Ecovacs Deebot Slim Vacuum cleaning Robot - Products and test review videos! Deebot Slim with Free Ac . . .
Low Profile Design, Floor cleaning ability with vacuum, Automatic Charging, Wheels automatically adjust to uneven surfaces. 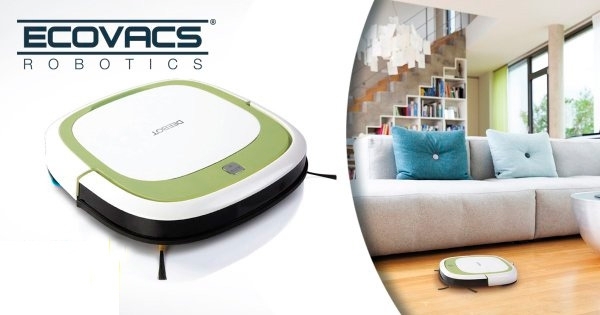 The new Ecovacs Deebot Slim vacuum robot is a combination of the Deebot D35 and the Deebot D45 vacuum cleaner robots. It combines the advantages of both models and thereby sets a new standard within the lower price group. The deebot slim robot has a low price tag but it is my no meansn cheap, it is very well built and one of the most reliable vacuum robot cleaners on the market. This deebot vacuum and mop robot also comes with a large lithium-ion battery to improve overall performance. The new Deebot has been designed with a beautiful and modern look that is noble with a high-quality finish. The Deebot Slim has a good suction power, but does not have a main brush. With his side brushes he also gets the dirt from the corners and edges. It is perfect for daily basic cleaning but struggles with carpets and animal hair. Thanks to its flat dimensions, the Slim can clean better than any other vacuum cleaner under furniture. This offers added value, since we rarely manage to clean there ourselves. The bed, sofa or wardrobe must have a clearance height of more than 5.7 cm from the floor, so that the slim can fit under it. Mit einer Wischplatte und einem Mikrofaserpad ausgestattet, kann der Deebot Slim auch zum Wischen benutzt werden. Es ist eine sehr einfache Wischfunktion ohne Wassertank. Erfüllt aber ihren Zweck und nimmt feinsten Staub und Schmutz von Boden auf. 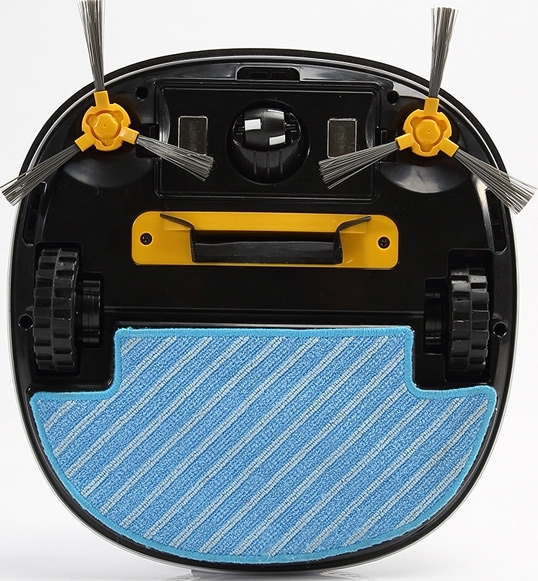 With a cleaning cloth and a microfibre pad, the Deebot Slim can also be used for cleaning. It is a very simple cleaning function without water tank. But it fulfills its purpose and clears away the finest dust and dirt from the ground. The Slim automatically returns to its charging station after cleaning. It will charge for about 3-4 hours before it is ready for the next vacuuming cycle. The Slim has a 2,600 mAh Li-Ion battery. Due to its light and simple design, it can vacuum for 1.5 hours before needing to recharge. The deebot uses its advanced stair detection technology to avoid falling down stairs. Objects are detected by its obstacle sensor and informs the robot to move carefully around the obstacle without causing damage. By using its infrared technology, the robot finds the charging station and returns to it independently. The Deebot Slim robotic cleaner is suitable for all conventional floors such as laminate, PVC, parquet or tiles. Bathroom, living room or kitchen. The slim robot has a weakness when it comes to carpet because it does not have a main brush. Watch the deebot slim robot cleaner being tested in the dirt arena, It has fantastic performance for such a small robotic. You can test the Deebot Slim in your apartment for 14 days. We provide a 2 year warranty on all of our robots combined with free customer support. Our team are personally here for you should you have any questions or problems. Contact us by E-mail or Telephone. "Still not sure? No Problem, Test the Slim in your apartment and if it not right for you, send it back!" Can the Deebot Slim also clean? Yes, the Slim has a basic cleaning function. This allows an area of 10-20 m² to be cleaned with a damp cloth. This is done without a water tank by wetting the microfiber cloth. How do I change the side brushes on the Deebot Slim? How do I change the battery on a Deebot Slim? How do I empty the dust container from a Deebot Slim? Which floor types can the Deebot Slim clean? The Deebot slim works on all floor surfaces apart from long fibered carpets. It may also experience problems with very dark, mirror finished floor. Why is there a problem with dark, mirror finished furniture and flooring ? Most of the robots function by using Infrared. The signal sent out from the robot can become comprimised by the mirror surface objects and cause issues with the navigation of a robot. Can I really test a robot for 14 days? Yes, Once you purchase the robot, you can then test it at home. Testing usally means that you will let it operate in 2-3 rooms to see if it is the correct robot for your apartment, Please clean it thorougly before returning it. Once returned, You will receive your money back (minus any return postage costs). Can the Deebot Slim clean under furniture? Yes, The Slim is one of the flattest on the market with a height of 5,7 cm. Only the e.ziclean Ultra Slim is flatter with a height of 5,4 cm. Both can clean under furniture with a height clearance of 6,0 cm. Vacuums generally have an average height of 10cm. Can the Deebot Slim pass over door sills? Only very flat door sills. The Slim can clear sills with a height of 0.8cm. If you have sills that are higher, then consider a Model with the SUV Function such as the Deebot D79, which can pass over door sills as high as 2,5 cm. Do the robots have a problem with cantilever chairs? Yes, Most of the robots tend to get stuck or have problems to get themselves clear of the chair. We suggest that cantilever chairs are placed higher up so that the robot operate at its maximum ability. Should the Deebot charge for a longer period by the first full charge? Yes. For the first charge, the Deebot should be left to charge for approx. 4-12 hours. It is important for a new battery to be fully charged so that it is able to hold a longer charge over its lif time.